UPDATE: After one year in operation, the Kenton Neighborhood enthusiastically decided to keep the Kenton Women's Village in their community with a staggering 119-3 vote!!! The Kenton Women's Village is a transitional housing community in North Portland for houseless women. 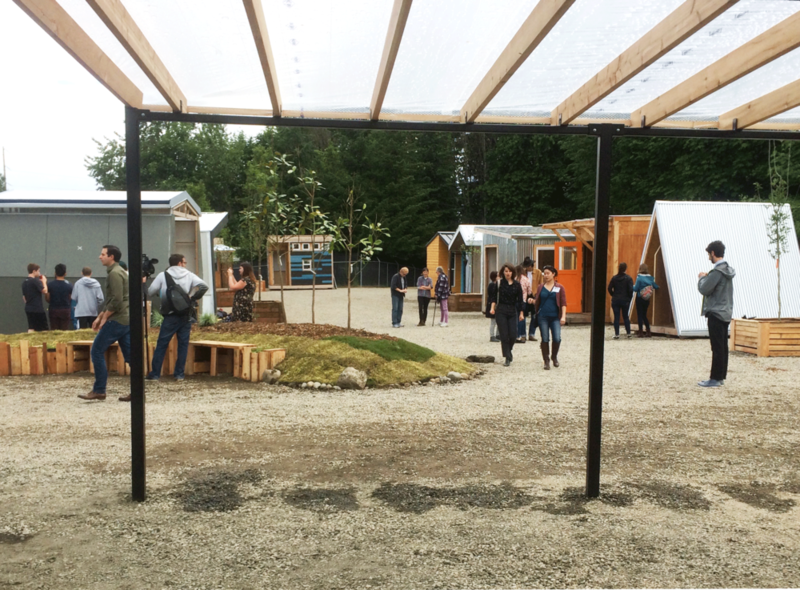 The project grew out of the POD Initiative, an effort led by the CPID with partners at City Repair and the Village Coalition in the fall of 2016 to explore how Portland's architecture community could respond to the city's state of emergency on homelessness. This initiative resulted in 14 tiny houses called sleeping pods designed and built by teams of architects, PSU students, and volunteers. The project found support in Mayor Hales' office and the City began exploring potential sites to place the 14 units, as well as additional shared kitchen, shower, and gathering facilities. 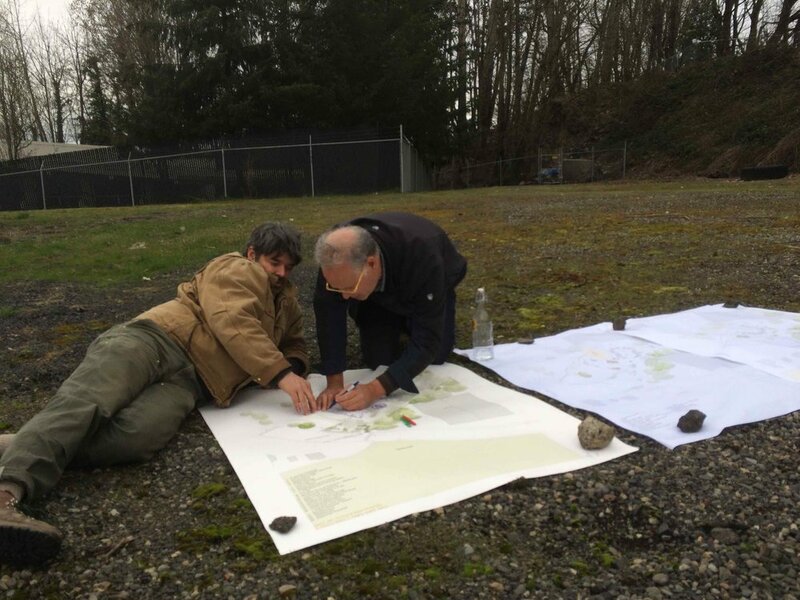 An underutilized one acre site in North Portland's Kenton neighborhood was identified and had characteristics ideal for a village, such as easy access to transportation lines, a secure boundary without being isolated, and close proximity to amenities including a library, park, and commercial district. Through discussions with collaborators it was decided that the village would be a women's village sponsored by the City of Portland's Joint Office of Homeless Services, operated by Catholic Charities, supported by the Village Coalition, and designed by the Center for Public Interest Design. While the site was available when the pods were completed in December 2016, the partners embarking on this effort did not want to simply "drop" a village into a community that was not prepared to welcome the village into their neighborhood. The Kenton Women's Village would provide immediate housing to women that needed it, while serving as a pilot project that could be replicated in other neighborhoods throughout Portland. With this in mind, the City promised to give the residents an opportunity to work with the project partners and vote on whether to allow the village to move forward in their neighborhood before any action was taken. The partners began regularly meeting with the Kenton community through their neighborhood and business associations and developed a shared vision for the village. After several months of collaboration, the Kenton neighborhood took a vote on March 8, 2017, that included speeches of support from Mayor Ted Wheeler, Commissioner Chloe Eudaly, a representative from each partner organization, and, most importantly, Kenton neighbors that had become advocates for the project and for houseless Portlanders through the process. In the end, Kenton voted to approve pioneering this collaborative village model in their neighborhood by a decisive margin of over 2 to 1. 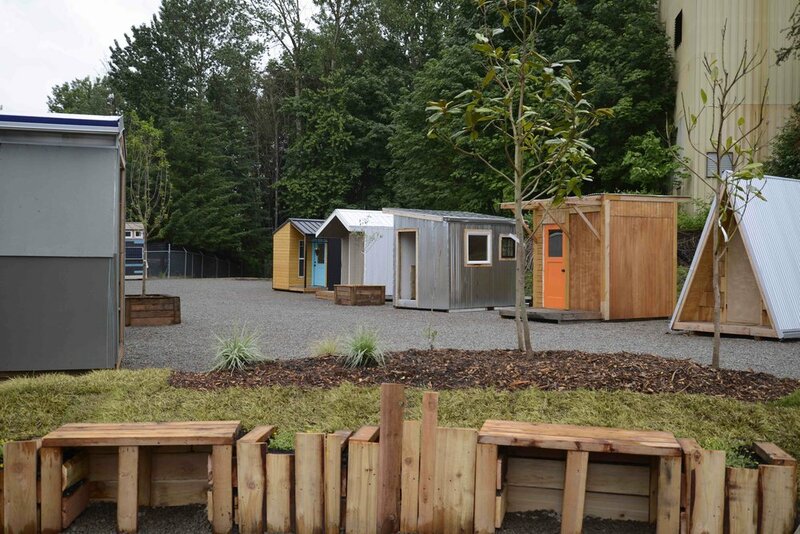 While the village model is informed by incredible communities and villages that houseless Portlanders have created for themselves, the Kenton Women's Village represents an entirely new step in the village evolution - a city-sponsored, fully supported, safe and sustainable village created through a participatory process. Like the POD Initiative, the success of the Kenton Women's Village is the result of a truly participatory design process that included Kenton residents, houseless women, service providers, and designers. Throughout the winter of 2017, CPID faculty Sergio Palleroni and Todd Ferry worked with students in a graduate architecture studio on the design of the Kenton Women's Village. This included working closely with a range of stakeholders through workshops, charrettes, design reviews, and focus groups to come up with proposals for a village design that could be affordable, welcoming, and conducive to community building and personal recovery. A key aspect of the design is that all elements had to be built in such a way as to be able to be easily removed from the site and placed in another location in anticipation of the site being developed in the future. Every woman has a tiny house (sleeping pod) to herself that was created through the POD Initiative. 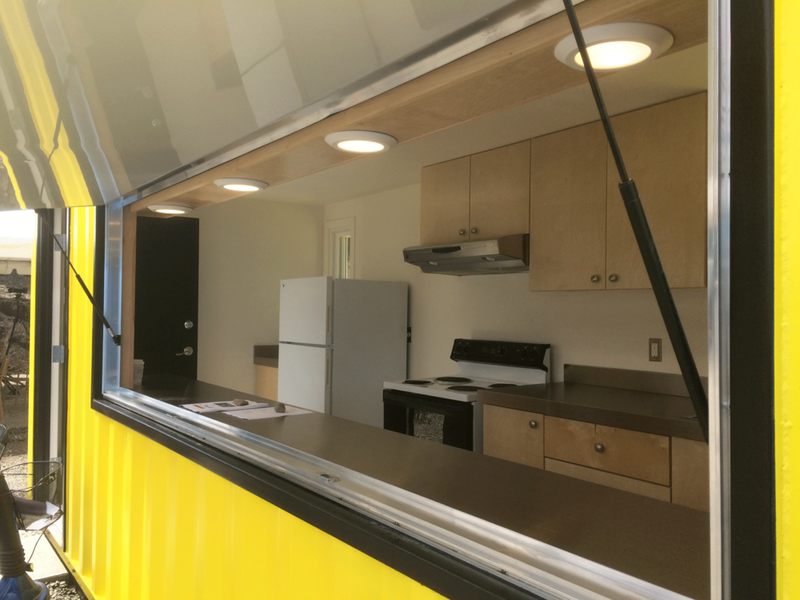 There is a large shared kitchen facility made from a bright yellow shipping container with a concession door that opens onto a covered dining and gathering space. 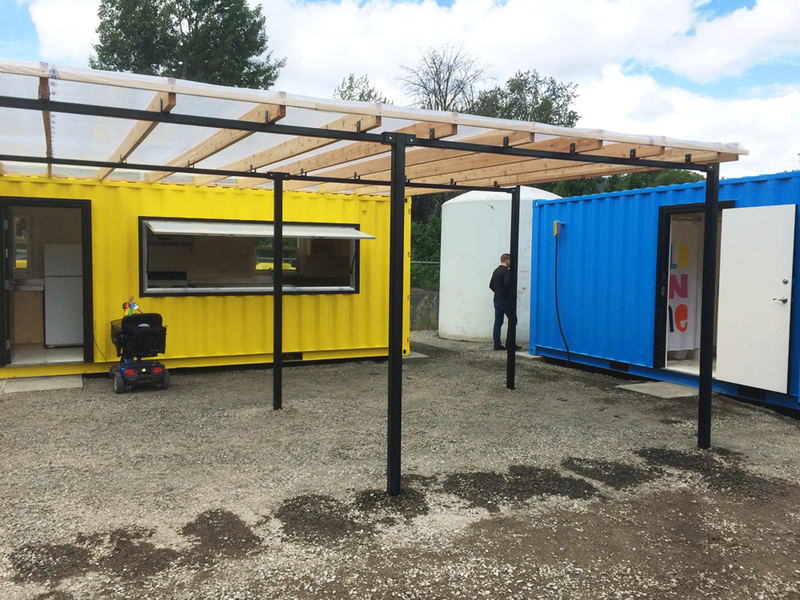 This area is enclosed on a second side with a blue shipping container hosting toilets, showers, and sinks. While electricity is available on site, there is no access to water or sewage lines, so water is delivered to a 6,000 gallon tank and captured in gray water storage tanks. 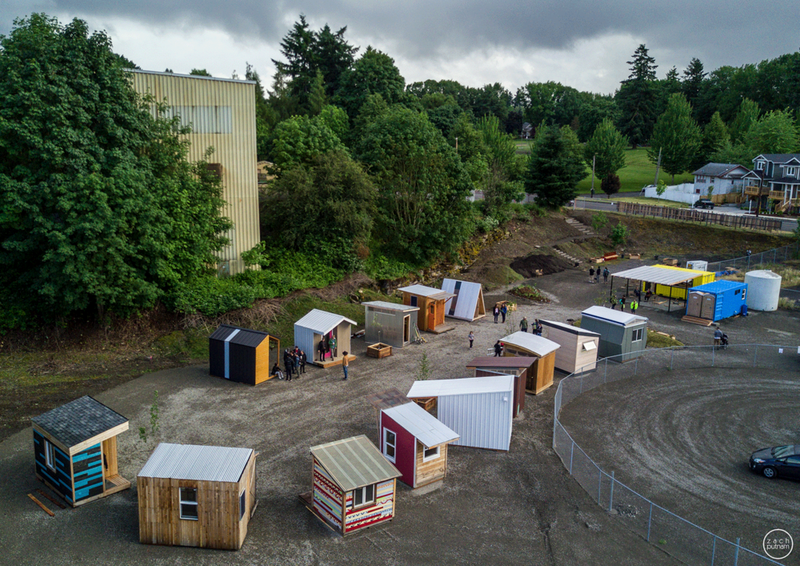 Students in the 2017 Public Interest Design seminar at PSU (a course within the PID Certificate program) designed and built site features aimed at placemaking. Partnering with City Repair, the students worked with dozens of volunteers over several days to create grassy berms creating a threshold that divides public and private areas of the site, steps embedded in a hillside that form a path from the village to transportation and the park, planter boxes to contain trees among the pods and create a community garden, and wooden screens adhered to chain link fencing for privacy and identity. While the site contains the necessary components for occupation, we see the village as an evolving site. For example, a CPID installation at the Portland Art Museum was designed to become a library/community space at the village at the conclusion of the exhibit. We are excited to work with the residents of the Kenton Women's Village to assist them in creating spaces to assist their community needs and desires. On June 10, 2017, 14 women moved into their new homes at the Kenton Women's Village. This community will continue to be supported by Catholic Charities who maintains a full-time site manager at the village, the Village Coalition who will provide assistance with self-governance and other support, and the CPID through ongoing efforts in placemaking at the village and collaboration with the residents (now expert villagers) on the design of Portland's next villages. The Kenton Women's Village is a crucial first step in advancing the village model as one necessary response to houselessness in Portland. This effort is a pilot project intended to be refined and replicated in other neighborhoods throughout the city. It has already inspired neighboring Clackamas County to pursue a village for veterans based on the Kenton model that they hope to open in early 2018. As City Commissioner Chloe Eudaly stated at the community vote night event in Kenton, "No neighborhood is going to be exempt from this conversation. This is a problem for all of us to solve. We're not talking about importing people, we're talking about housing your houseless neighbors."